As you’ve probably noticed, it’s been a bit quiet around these parts for the past week. I hope to get my round-up review of Shadowland: Power-Man #3, Shadowland: Moon Knight #3 and Thunderbolts #149 up in just a few hours, but first I wanted to write a post that has very little to do with Daredevil. This post is a eulogy of sorts, a tribute to a special friend of mine who more often than not was at my side every time I sat down to write a post. 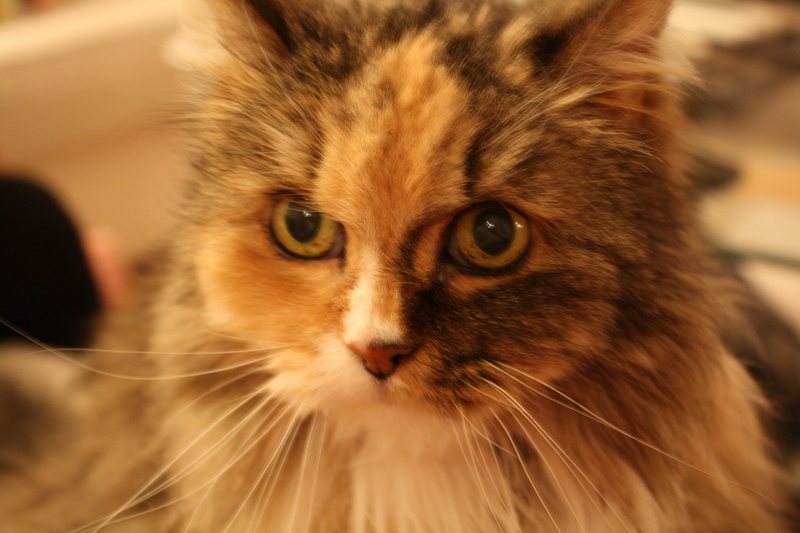 My cat Smulan died Friday morning at the respectable old age of eighteen, and her absence pains me greatly. Smulan came to my family as a stray cat more than seventeen years ago, in the summer of 1993, when my brother found her in a bush in our back yard, emaciated and with matted fur. To this day, we have no idea of where she came from. There was no way of identifying her or her owner and my dad called it in to the local police but no one ever claimed her. 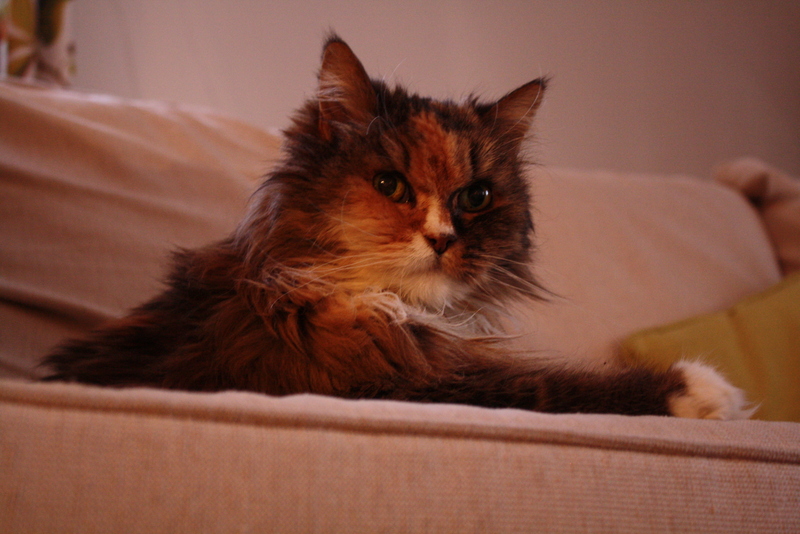 A trip to the vet revealed that she was a young cat, less than a year old and that she had likely been born in the fall of 1992. 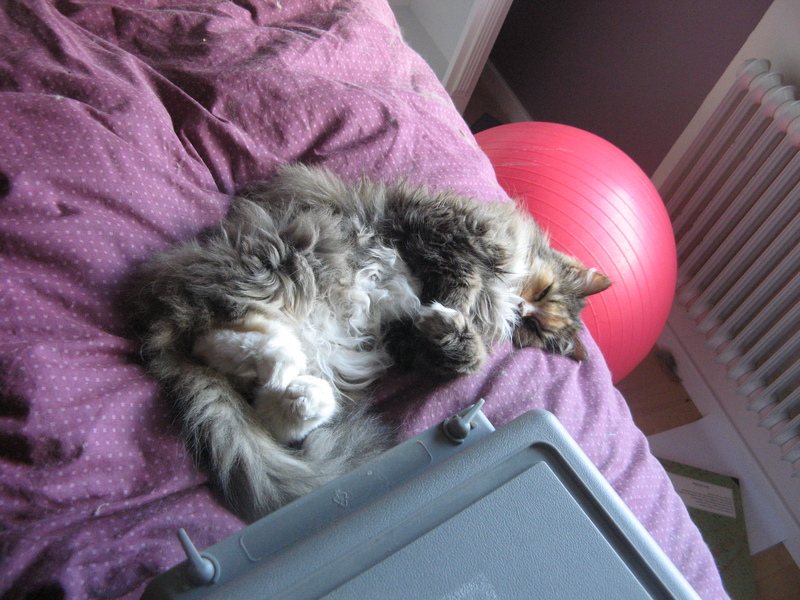 She was an unusually beautiful cat with a long coat and a kitten-like face and the veterinarian guessed that she might be a cross between a Persian and a Norwegian Forest Cat, a fairly common mix. 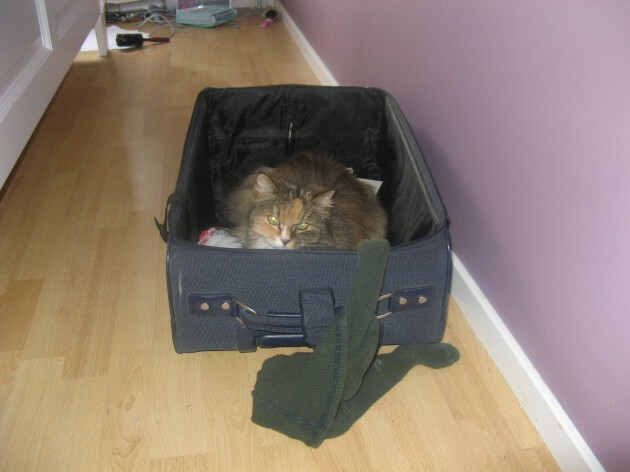 At the time of her arrival, I was visiting a pen pal in San Francisco and I remember urging my dad to find her owner, if he could, before I came home and grew attached to her. Dad named her Smulan, a name I wasn’t really that happy with. 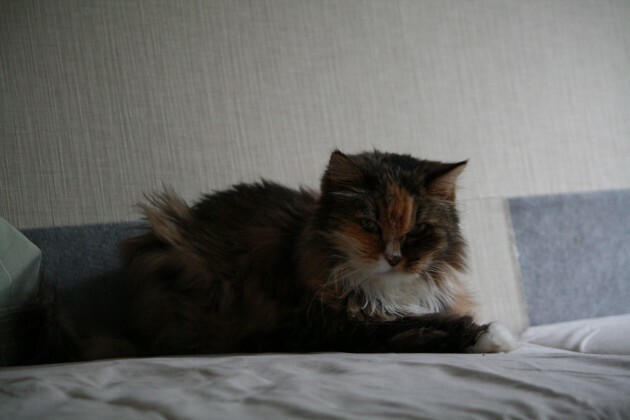 It’s a cute name (it literally means “the little crumb,” “the little piece of something” or “the smidgen”), but it’s also a hugely popular pet name in Sweden and I would have wished for something a little more unique for such a pretty cat. Smulan ended up staying with my family, and later my dad after both my brother and I moved out and my parents divorced, and made her own little kingdom of the yard around my childhood home. She was a perfectly useless hunter, I think we found a dead mouse once or twice, but I’ll never forget the time she brought home a little bird. A live one. Proud as can be, she showed up at the front door, marched inside and released the poor thing in the dining room. She must have been confused by our reaction, one of complete horror, but at least her prey lived to see another day after we caught it and set it free. In 2005, after I moved back from my last one-year stay in the United States, I moved to an apartment just 300 yards from my dad’s house, and that’s when it was decided that Smulan should move in with me. I enjoyed her company and she enjoyed mine. I should expect no less given all the hours I had put into making myself her favorite person by cuddling with her and giving in to each and every one of her diva antics. 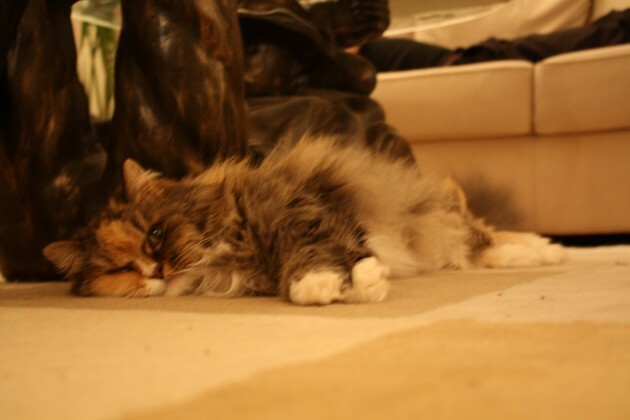 Oh yes, she was a real diva, queen of the world and keenly aware of how adorable she was. Smulan stayed fit well into old age, and she was still going pretty strong (well enough to be able to climb trees, and get herself down from them) by the time she was diagnosed with diabetes two years ago. Given how relatively healthy she still was, it wasn’t a hard decision on my part to keep her with me and treat the diabetes with twice-daily injections. She responded very well to the treatment and considered the injections a minor nuisance, at most. It gave her two really good years. When Smulan’s fluid intake started to skyrocket a couple of months ago, I didn’t need a visit to the vet to figure out that it was chronic renal failure, and I gradually came to terms with the fact that her days were numbered. She did okay for a few weeks, even though she started to slow down a bit, but over the last week she became increasingly withdrawn and did little besides sleep, eat and drink. When I came home Wednesday night, she had trouble walking and between that and the weight-loss and the overall apathy, I decided it was time. Friday morning, my dad and I took her to the vet to send her on her way as humanely as possible. The fact that she didn’t resist the brief car ride, or even being held in her fluffy white blanket for more than thirty seconds (she was never much of a lap cat, and didn’t like being carried), confirmed the sense that she was ready to go. The spark was gone. When it was time, she was given a sedative and quickly laid down on her blanket. I kept stroking her and looking her in the eye until the very end, and I could literally see the moment life left her body just seconds after they gave her the final injection. It was as if a little light went out. On the whole, it went as well as could possibly be expected and I’m relieved that she showed no signs of anxiety. The last couple of days have been remarkably okay. My mom and I made an excursion yesterday and I even managed to get to work late Friday afternoon and have a few drinks with my co-workers later in the evening, but then, when I least expect it, the grief comes over me and I’ve shed a lot of tears over my beautiful Smulan. I miss her in the evenings especially since her nightly routine was to climb up on top of me and sleep on my chest for ten-fifteen minutes. She did that every night, except for the last couple of weeks of her life. I keep seeing her out of the corner of my eye and it’s strange to wake up and only have to fix breakfast for myself. In a few days, when I get the ashes back, we will spread them on my dad’s lawn, where she loved to be. Rest in peace, sweetie pie, you will never be forgotten. I’m sorry about your cat. I’m sure she knew how much you loved her. Sorry to read about that, Christine. I hope you can slowly start to feel better. She really was very beautiful. I very much enjoy that slight sense of annoyance and entitlement in her eyes — perfectly feline. This is very sad news for you, Christine. I hope that before too long the tears will start to be replaced by the smiles borne out of happy memories. Sorry for you loss. Great lookin cat. My condolences, Christine. Be heartened by knowing that you and your family gave a her a good life, one that she might otherwise have never had. Now back to my half-finished post! Since November is NaNoWriMo, I thought I might turn it into a blogging challenge rather than a regular writing challenge this year (I’ve failed miserably at actually writing a novel in the past), so I’m going to try to post at least something every day. We’ll see how I do, it should at least help keep my mind off things. Thanks again everyone for your kind words. Great pictures and a great story….thank you for sharing…. Pets bring so much to our lives, very sorry for your loss. She seemed a sweet kitty. I am sorry for this late reply. And I am truly sorry for the loss. Smulan was very beautiful. The pics are amazing. It’s very heartening to at least know from your story that she lived a good life since coming into your childhood home back in the summer of 1993. My condolences.